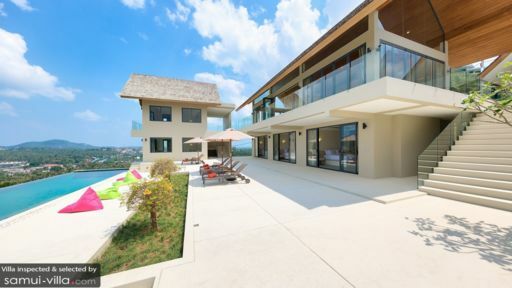 Perched high atop the hills of Bophut, Nojoom Hills encapsulates the essence of luxury living. 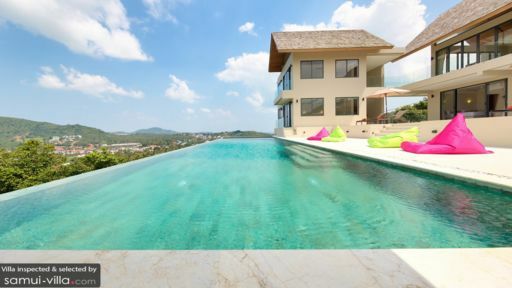 A prime hilltop location, sweeping views out to the sea, a spacious infinity pool and an array of state-of-the-art amenities are perks enjoyed by vacationers lucky enough to call this villa their holiday home. Containing six beautifully appointed bedrooms, Nojoom Hills is ideal for accommodating large travelling parties of 12. Each of the six bedrooms are furnished for comfort and relaxation. The colour palette invites rejuvenation, with soft hues of cream and gray, and furnishings are kept minimal to create a sense of spaciousness within. The plump double bed or twin singles are decked in quality linen, and other amenities common across the bedrooms include an accent chair, wardrobes, block out curtains, air conditioners and private en suite. Sun-soaked and expansive, the grounds of Nojoom Hills serve as the central hangout for guests. In the day, laps and dips are enjoyed in the sparkling infinity pool, in between lazy sunbathing session upon the colourful bean loungers or poolside recliners. When dusk falls, the poolside sala becomes a favourite hangout for sundowners and al fresco dinners. Fire up the grills for a poolside barbecue feast! 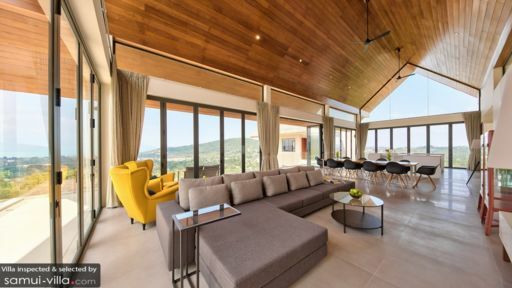 Each of the living spaces at Nojoom Hills are bright and airy, with large windows and glass sliding doors that allow plenty of natural light to flood in. The common area is wonderfully expansive, with vaulted ceilings and an open plan layout. The open kitchen boasts a sleek, minimalist design, with elegant, all-white fixtures. It extends out to include a 10-seater dining set and a lounge outfitted with flat screen TV, glass coffee table, sofa set and armchairs in an eye-catching hue of yellow. Step out from the common area to access a breezy terrace offering views out to the pool. Nojoom Hills offers housekeeping services, security services, a daily breakfast service and airport transfers. A baby cot and high chair are available for use free of charge. Personal chef services are available at additional cost. Stocking up on necessities is a breeze, with easy access to supermarkets like Big C Supercenter and Tesco Lotus Samui (located about a 10-minute drive away). Popular attractions in the vicinity include Big Buddha and Chaweng Beach; the former is a 15-minute drive from your villa, while the latter requires a ride of about 25 minutes. Bophut Beach is an eight-minute drive away, and nearby you’ll find the charming Fisherman’s Village, where a variety of shopping, dining and drinking establishments await.